Building on the in-depth knowledge of small area social and economic statistics, the consultants have frequently been tasked with developing Resource Allocation Systems. In the public sector, these particularly involve the development of transparent systems that are based on objective measures of need and thus provide for a fair distribution of resources. In the private sector, the consultants have accumulated considerable expertise in the development of branch performance and branch optimisation systems, predominantly in the financial services and retail sectors. The Social Inclusion and Community Activation Programme (SICAP) will launch in 2015. The aim of SICAP is: “To reduce poverty, promote social inclusion and equality through local, regional and national engagement and collaboration.” SICAP’s vision is to improve the life chances and opportunities of those who are marginalised in society, living in poverty or in unemployment through community development approaches, targeted supports and interagency collaboration where the values of equality and inclusion are promoted and human rights are respected. 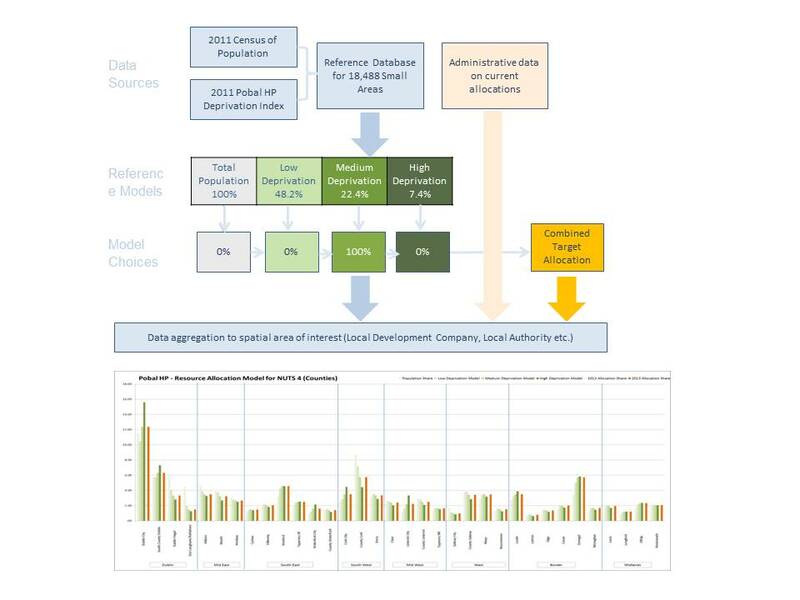 The Resource Allocation Model for Local Development Companies (LDC-RAM) has been jointly developed by Pobal and Trutz Haase – Social & Economic Consultant. It aims at providing a ready tool for the spatial analysis of existing resource allocations to local development companies, as well as providing a tool for deriving target allocations based on stated objectives and criteria. The LDC-RAM does not make decisions, these are made by relevant policy makers and personnel within the Department of the Environment, Community and Local Government (DECLG), but it provides a tool to facilitate such a process in a rational, objective and transparent manner. The following paragraphs highlight the key features of the LDC-RAM. Dr. James Reilly TD, Minister for Health today (17th July 2012) announced the planned recruitment of over 270 new staff to work in Primary Care. Minister Reilly stated that “key frontline staff will be recruited, funded by a special allocation of €20m which was set aside as part of the HSE’s 2012 National Service Plan to fill posts in Primary Care”. The funding will provide for the employment of 17 Clinical Nurse Specialists to support the Integrated Care Diabetes Programme and some 255 other Primary Care Team posts, including Public Health Nurses, Registered General Nurses, Physiotherapists, Occupational Therapists and Speech and Language Therapists. Central to the modernisation of the Irish health service is the development of a greater range and volume of community based services and the growth of the multi-disciplinary team model to strengthen and enhance Primary Care services. The recruitment of additional staff to Primary Care Teams will be instrumental in creating an environment which enables structured approaches to chronic disease management, enhanced multi-disciplinary team working, and the integration of services between primary and secondary care. This shift in emphasis to community based services is good for patients, clients, health professionals, acute hospitals and it delivers the best value. For Department of Health Press Release click here.